Is it possible to check out your competitors without falling into a deep, dark pool of insecurity and self-doubt? Paramount to this process is the act of objectively, strategically seeing what your competitors are doing. There’s little benefit to weeping with envy over your competitor’s perfect prose but it is helpful to notice how many service offerings they have or how often they post on Facebook. There’s a fine line between diligently staying your course and sticking your head in the sand. It’s just ego to think you never need to change and adapt. You must know what is going on in the marketplace and more importantly, what your prospective customers are seeing and experiencing if you want to stay relevant and compelling. Great businesses understand the fine art of this balance between nimbly reacting to competitor moves and staying true to their own vision. With that in mind, I created a handy, dandy worksheet for you. This worksheet will help you gather tons of helpful information and remove a lot of those self-esteem ruining moments. How many products or services do they offer? Do they post their prices? If so, how much do they charge? If they have similar offerings to what you have, are there features they include in the price or do they charge extra? Are their offerings one-on-one and customized? Do they offer packaged info products? Group offerings? A mixture of both? Are their offerings evergreen and always available? Or do they open and close periodically? Does it seem like they’re a one-person operation? Or do they have a large team? Do they have testimonials? How many? Are their testimonials on a separate page or on specific service pages – or both? Does their site look professionally designed? Is it easy to navigate? What is the vibe and the main messages or benefits they tout? How do they present their offerings: by industry, by audience, by type? Do they have a newsletter? How do they entice people into signing up for their newsletter? How many places do they link to or promote their newsletter and other offerings throughout the site (cross-linking)? Do they have a blog? If so, how often do they post? Are their blog posts related to their offerings? How long is their About page? Are there outgoing links on their About page? If so, where are those links going? Do they use a pop up to capture emails? Which social media platforms are they on? Where are they most active? How often do they post on those channels? What type of content do they post? How many followers/fans do they have on each channel and more importantly, how ENGAGED are those fans? (RTs, Shares, Likes, Comments).Which posts get the most comments, shares or likes? Are there common threads you can see in their topics, format or which posts are most popular? Do they @mention people or use specific hashtags? What “voice” do they use in social media? Is it consistent with their brand? What link do they use on their social media profiles? Does it go to their home page? A landing page? Print this out, pour yourself a glass of wine (I may be drinking a nice shiraz) and see what insights you can gather from your competitors. And then use that information to tweak your online space accordingly. 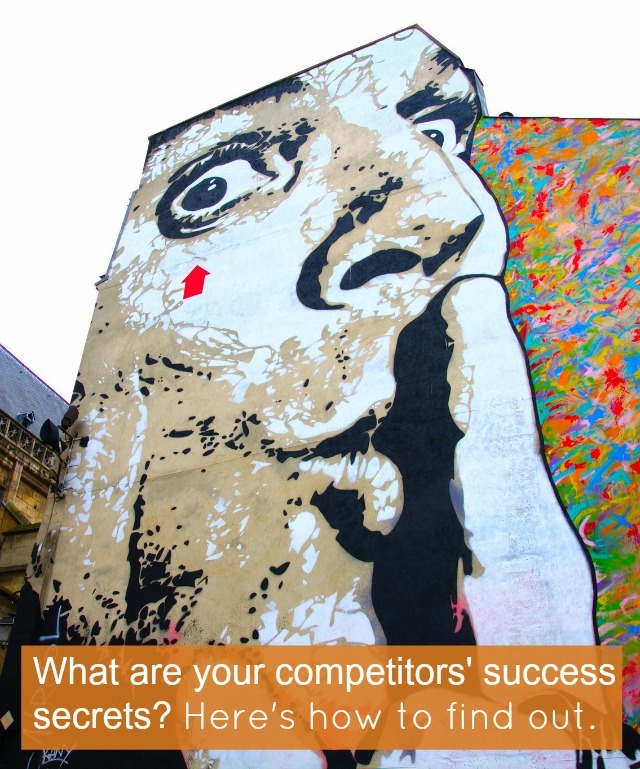 Have you ever researched your competitors online? Share your best tips in the comments! P.S. If you find that most of your competitors are using Twitter more effectively than you are, this will help. If you need help with Facebook, read this.